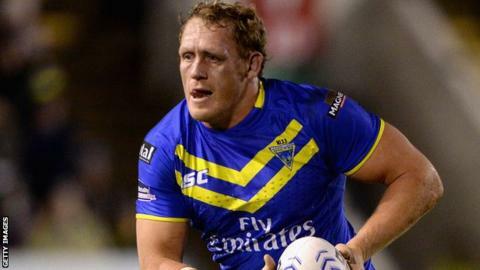 Warrington will be without joint-captain Ben Westwood for around a month because of a calf injury. The England second-rower, 32, has been with Warrington for more than a decade and has led the side along with Michael Monaghan this term. "Ben is a massive loss," said Wolves team-mate Stefan Ratchford. "You only need to see the amount of work he gets through in a game to realise he's going to be a loss to any side," he told BBC Radio Manchester. "In the last couple of seasons, we've lost Ben for a couple of games at a time or he's been rested and we know we can cope without him. "It gives an opportunity for someone else and hopefully they can perform up there towards Ben's standards." Sixth-placed Warrington host Hull KR in Super League on Friday and will hope to repeat Sunday's Challenge Cup fourth-round victory over the same opponents.